Mary Norris recently left her job as copy editor and query proofreader after more than thirty years at the New Yorker. She is following up her series of Comma Queen videos and her best selling book, “Between You and Me: Confessions of a Comma Queen,” with a book about her love for the Greek language and the culture of Greece. Our conversation about “Greek to Me: Adventures of the Comma Queen” is a sublime excursion into punctuation, the copy editor’s tasks and the writer’s life. Pulitzer-prize winning reporter, author and documentary filmmaker Hedrick Smith talks about the grass roots activists across America who are organizing for voter rights and against gerrymandering. Smith argues in his new film, “Winning Back Our Democracy,” that citizens can overcome the money that is corrupting democracy. Scholar and novelist Siri Hustvedt on memory and time. For many reasons, humans have developed ways of thinking that deny animals emotions. We have viewed them as bundles of rigid instincts, automatons acting only on stimulus and response. But that is changing. Almost every day brings new scientific evidence that animals have emotions, make decisions based on inference and experience are cognitive thinkers and sentient beings. Frans De Waal studies primates, loves fish and offers in his latest book, “Mama’s Last Hug” an exploration of animal emotions, animals including ourselves. America seems unable to decide how to educate its children. We swing between reforms unsure of what we need more of and which direction to go. There are ongoing debates about how to shrink the education gaps between the well offand the under resourced. Successes occur, but they seem to struggle for acknowledgment and replication. At Length with Octavio Solis, "Retablos." Retablos are devotional paintings, usually done on tin. The tightly framed images tell stories of trauma, temptation and redemption. Octavio Solis is an award winning working playwright immersed in the culture and politics of our time. His plays tell the stories of rural America, of Latino America, of border America. His community of artists are telling stories that reveal the changing culture of the nation and the continuing connections people still have across different borders, nations, age, race, culture and politics. I took a different approach to these two episodes. TheChinatown/International Districtonce housed thousands of working people in hundreds of small rooms in residential hotels. These single room occupancy or SRO hotels were viable and affordable housing options for almost 100 years. But starting the 1970’s new ordinances forced the shuttering of many of these hotels. If you look up from your wandering in the International District today, you will see many of the windows in the uppers floors boarded up. With the booming Seattle economy, these buildings are now being rehabbed, but the rents are usually market rate, unless the developer is a non-profit. So going forward, the working poor, in dire need of affordable housing, won’t find many options in a neighborhood they once dominated. 00:00 Meeting on the street, talking about writing, journalism and the noisy streets. 9:32 We started our tour at the 100 year plus Kong Yick Buildings, flagship buildings of the final, historic Chinatown District. 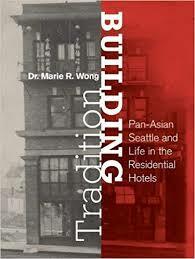 9:52 The first core of Chinatown was at First and Yesler and why it moved into its current location. 13:00 Developing a Chinatown that won’t move and becomes the conscious execution of Chinese America communities are constructed in Seattle. 14:00 The building of the first SRO’s by the Chinese Free Masons. 15:48 The recessed balconies reveal that Chinese associations built and occupied the buildings. The traces of histories in the buildings. 17:36 The histories of the East and West Kong Yick Buildings and Corporation. 20:26 Can the small businesses housed in Kong Yick as well as other former SRO’s survive? 24:21 The Ozark Hotel Ordinances and how they changed Seattle housing. 29:00 Restoring these buildings costs between 24-26 million. Developers either partner with community non-profits or charge market rates. 30:20 What was a typical SRO building and room. 350 different SRO’s in downtown Seattle area. 33:42 Wong feels blessed to have met so many people who grew up in the district. 34:35 The district is changing as city’s 1970’s and 2014 housing ordinances reclassify buildings forcing more closures and changing the district with even more impact than even the WW2 incarcerations. 39:06 SRO’s seen by elites as substandard historically and still today even as they are seen as good housing options in some cities. But Wong feels the city council has regulated the city out of affordable options. The money spent and taxes assessed have to filter back into the community. 45:02 Residential Hotel buildings were zero lot lines. Look up to differentiate one building, and its history, from the next. Compare the New Pacific and the Panama hotel. 46:00 We gaze at boarded up buildings. Is the district losing its identity? 47:30 The district entices developer who see the opportunity for higher rents next to the booming downtown core. 50:00 Imagine the district in the 1900’s. It was a boom time for construction of unique SRO’s, like the Milwaukee Hotel, redeveloped by James Koh. Now SRO’s style is persona non grata in many neighborhoods. 55:00 There are light-wells inside most of these half block sized buildings. 56:00 The businesses in the Milwaukee Hotel are emblematic of the new ID. 57:28 Bob Santos, hero of the district. 59:00 Will older Asian-American districts disappear? Will new districts arise? Some rich people give away some of their money. They are philanthropists. They probably see themselves as doing good. Are they? Through their wealth, philanthropists influence society. Is that fair? Rob Reich will be talking about the cons and pros of philanthropy with Jeff Raikes,co-founder of the Raikes Foundation and one-time CEO of the Bill and Melinda Gates Foundation. Here is an annotation of our interview. 02:12 The organizing institutions of philanthropies in the U.S.
03:05 School fundraising prompted his interest. 05:24 Why are philanthropies tax exempt? 06:20 Rockefeller and the dawn of modern foundations. 10:02 Is having lots of money inherently undemocratic? 11:45 Philanthropies contribute to the calcification of society. 19:30 Big philanthropic institutions should pioneer new ideas. 26:56 Why not take away their tax exemptions and deductions. 29:10 Why Phil Knight should have burned his 400 million dollar gift to Stanford. 31:48 The appropriate attitude is to engage in our government. Philanthropy should support government efforts, not circumvent them. 34:59 The philanthropists who work that way. Uber has disrupted the taxi industry around the world. But its way of doing business may be reshaping other industries. A conversation with Peter Sagal, a marathon runner, Runner’s World columnist and author of The Incomplete Book of Running. His day job, host of the Peabody award winning NPR news quiz, “Wait Wait…Don’t Tell Me!" Chris Hedges reports on the current state of America. He sees a declining empire in the last stages of dissolution. Harvard Geneticist David Reich explains the latest discoveries on human evolution. New technology allows scientists to extract and analyze ancient DNA from ancient bones. Reich explores how the genome contains the history of our species and our relationship to ancient humans. Biologist Thor Hanson with his Bee Tube. Humans have about 8% virus DNA in our bodies. Who knew. It might be time to rethink our notion of the evolutionary tree of life. Turns out that life on earth isn't simply the development of simple to more complex organisms. It is that, but it is something else too. Humans are related to viruses and bacteria as well as chimps and other sapiens. All along the path of evolution, DNA from one species is able to move over to another. Horizontal gene transfer might sound like something done in a laboratory, like putting a squid gene in a rabbit so it might glow. Weird as that sounds, it has been done. But It turns out it is more normal than was once understood. Sharing DNA between species has been a part of evolution since life began. Science writer David Quammen says perhaps a better metaphor than a tree might be an elaborate topiary. The Tangled tree: A Radical New History of Life,” explores the new scientific understanding that tangles up the "tree of life" metaphor. I spoke with Quammen a few weeks before his September 10, 2018 talk about his new book for Town Hall at Pigott Auditorium on the Seattle University campus. Plant A Seed, Build A Community- Seattle Pollinators Week. Don’t swat those buzzing little bees and flies. Their honeycombs knit communities together. James and Deborah Fallows spent the last five years piloting their small plane across America. They visited small cities where citizens are working together to build communities where opportunity and connection matter. Their book, “Our Towns: A 10,000 Mile Journey Into the Heart of America,” can be read as a tonic to our toxic national politics. It's hard to stamp out a weed. Beer has its own rewards, and has throughout its history.